DANVILLE, Calif. — It’s pitch black in this cool East Bay ’burb just after 5 a.m. Tuesday, and the Oakland Raiders’ 25-year-old MVP candidate rolls into a coffee shop parking lot in his pickup truck with the child seats in back. Derek Carr is polite, but in a bit of a rush. You’d think the rush is because of the short week, as the Raiders prepare to play a crucial game against Kansas City on Thursday night in middle America. But leaving the house at 5:10 for the 40-minute ride to work is customary for this player who burns to be great for a long time. “This is every day,” Carr says, hands deep in his pockets on a 41-degree morning. 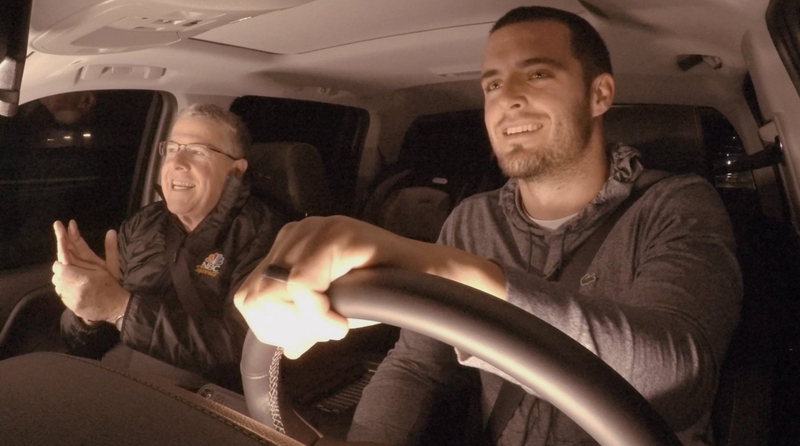 I’ll take you with us on Carr’s drive to work Thursday night on the NBC “Football Night in Kansas City” pregame show, which begins at 7:30 p.m. ET, before the game for AFC West supremacy between the 10-2 Raiders and 9-3 Chiefs. (That’s my other job, working for NBC on the football show.) I think you’ll be engaged. America doesn’t really know Carr yet, and I hope you have a better feel for him after seeing this TV piece. And not just for the football—he is on pace for 4,501 yards and 32 touchdowns, and is completing 66 percent of his passes—but for the kind of person he is. So I urge you to watch. 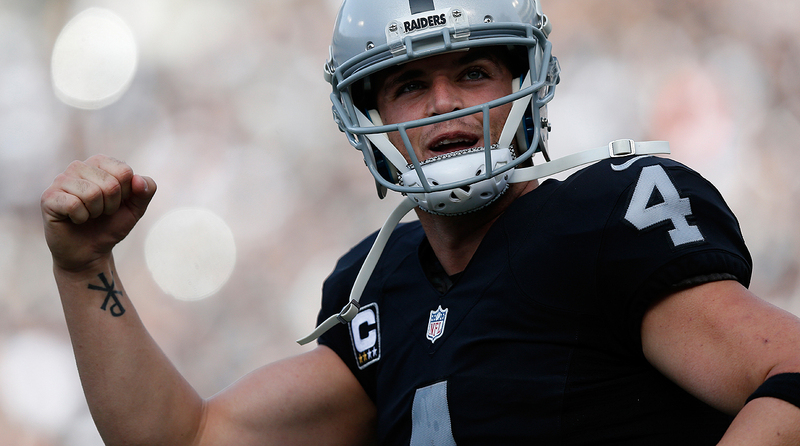 Derek Carr says excellence off the field is as important to him as Raiders success. What I found interesting—and what I think will come out on TV—is his attention to detail in other parts of his life. For instance, I asked him where he got his drive for excellence. “Probably my parents,” he said, steering his pickup on an already-crowded Interstate 580 with the early rush-hour traffic. “When they raised me, they laid a foundation for me obviously with my faith, and they showed me the kind of man they wanted me to be. My dad showed me every day the kind of man he wanted me to be … and now I get to show my boys what it’s like to actually be a man, to actually deal with things. How you treat your wife, that’s excellence to me. Football is a game, and my character will rub off on my work ethic and the weight room and the film study and all those things, but when it comes down to excellence, I think about it off the field. I want people to think of my life, I want people to watch this and see me and know that’s who I am. Derek Carr has played like an MVP candidate this season, ranking in the top seven in passing yards, touchdowns and passer rating. • THE FINE FIFTEEN: Where do the Raiders rank on Jenny Vrentas’ list? It’s tough for stars to stay hidden for very long in the NFL. This league mints new stars annually, almost monthly. I walked away from my time with Carr thinking he’s going to be a face of the NFL for a long time. 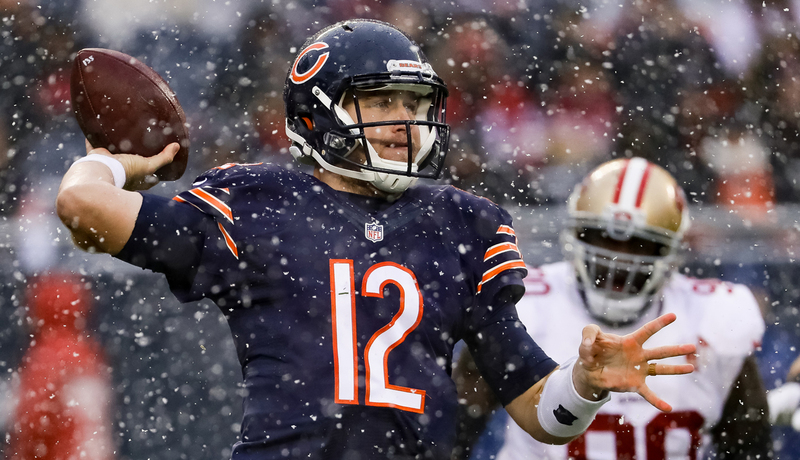 Matt Barkley has been a pleasant surprise in an otherwise lousy season for the Bears. HAVE WE SEEN THE LAST OF CUTLER? Peter, does Matt Barkley's play in two games make it even more likely Jay Cutler will be elsewhere next year? Obviously the defensive competition hasn't been the best, but has he shown enough that Chicago can trust him to be the backup or even compete with Hoyer for the starting role next year? Assuming the Bears draft a QB next year, how do you think this plays out? Great question, Mark. Hard to answer it without seeing Chicago’s last four games, which are against four playoff contenders. Specifically, I want to see Barkley’s poise against the onslaught of Detroit’s resurgent pass rush this week, and Minnesota’s stifling rush in Week 17. Both of those are on the road. If Barkley is competitive in those two games plus the two home games (against Green Bay and Washington), obviously that changes everything. In any case, I can’t envision Cutler being back for big money. I’d draft a quarterback if I were GM Ryan Pace, and develop him in 2017 with a vet like Barkley or Hoyer holding the fort. Actually, you know what I think would be interesting, and what I would do if I were Pace? I’d offer my first-round pick to New England for Jimmy Garoppolo and a third-round pick. It would be tough for Bill Belichick to turn down a top-five pick for Garoppolo. Very tough. But I’d do it if I were Pace—unless he liked any of the quarterbacks in the draft more than Garoppolo. The only barometer I’d use if I were Pace is not price tag, but rather whether I thought the Patriots’ backup was good enough to be his quarterback of the future. In that case, make the deal. I see a lot of people mad about Jeff Fisher getting a new contract. I see it this way: The Rams are in a lame-duck status until the new stadium is built. The stadium is going to be completed for the 2019 season. Fisher's contract is over at the end of the 2018 season. I believe that keeping an average coach on board, letting Jared Goff develop, and recovering from their trade to get Goff sets up for a really splashy inaugural season of a new stadium. I believe the Rams will bring in a big name like Sean Payton in 2019, have a developed quarterback, and will really make a splash in the new stadium and make the playoffs. Hard to see into 2019, Daniel. I think the point that’s being missed about the Fisher deal is this: It’s basically a $7 million or $8 million golden parachute for an owner paying $2 billion to build the prettiest stadium in the United States in the glitziest city in the United States, instead of making Fisher coach the last year of his contract as a lame duck in a season in which the Rams were surely at a big disadvantage. If the Rams stink it up down the stretch and finish 5-11 or 4-12, Stan Kroenke has the right to dump Fisher for one guaranteed year of pay—which I believe is likely in that scenario. Now, if the Rams had extended Fisher for three guaranteed years, that would have been silly. But one guaranteed year, knowing he might not coach it if the team went in the toilet this year? Not such a bad option. Imagine an NFL game in which one team kicks 10 field goals, scoring 30 points and the other team scores five touchdowns, scoring 35 points. After the game, the “losing” team declares that they really won the game because they scored 10 times while the other team only scored five times. Of course, that’s completely false because the rules of the game don’t count number of times scoring, they count the final score. And teams base their entire game plan and in-game strategy on the rules as they existed before the game was played. The absurdity of the losing team's claim is right up there with your “analysis” of the Electoral College. Trump and Clinton played according to rules that have existed since George Washington ran for his first term—and both candidates based their game plan and their strategy on the fact that they had to win 270 electoral votes, not win the popular vote. But now the losing team is trying to say it really won; all you have to do is change the rules after the game has been played! Now maybe you’re not saying this. Maybe your point is that the rules should be changed before we play the next game. That’s fine, but you should know that those in politics who are talking like this don’t care what the rules are, they just want to undermine Trump’s presidency by suggesting he won the election by a technicality. Trump did win in a landslide. There were 51 elections run on Nov. 8 and Trump won 30 of them. All I said was Trump trumpeting winning the election in a landslide when he lost the popular vote by 2.5 million votes is comical. Nothing else. I read the large portion about Henry Burris and the Grey Cup in your column Monday. I can’t tell you how much I enjoyed that part. I am a huge NFL fan. I was born and raised in Ottawa but have always gravitated more toward the NFL game. But as with everyone in this city I have always been a fan of our football team (when we’ve had one) and with the Redblacks when they came back into the league. Your piece was so heartwarming to read. How great a city Ottawa is, how great a capital city it is. How great our country is and how free we are. We are as neighbors always directly linked and compared. We share a lot of values and similarities, but it’s our differences that make us great and original. Thank you for writing to that point, and thank you for giving this fan a big smile about his city, his team and who he chooses to read every Monday. In two phone conversations with Henry Burris totaling maybe 80 minutes, it was difficult to not come away with strong and positive feelings for him and his career and his attitude about life. I have a soft spot for Canada. My wife and I took a 35th anniversary train trip across the Canadian Rockies last year; I went to two CFL games to open the 2014 season (Jenny Vrentas to a third) and loved it … the spirit, the love of the game and franchises, the fun of the wide field and the different rules. And Henry Burris illustrates, to me, why athletes play the games they play. He loves football, and he’s forever thankful to the country that adopted him for the chance to build a career and a family. In hockey, the backup goalie plays about 15-20 games in an 82 game season. Why don’t NFL teams with a QB in his mid- to late 30s consider giving that QB a rest against inferior teams? If Jimmy Garoppolo were to play against Cleveland and Jacksonville, the Pats would likely win, and Brady’s body would be theoretically fresher later in the year and playoffs, wouldn’t it? It would also give the backup some valuable snaps in the event the starter gets hurt. Question for you: What happens the first time the Patriots, sitting Tom Brady, lose to a team everyone assumes they’d beat? And what happens when the Chargers sit Philip Rivers and lose to anyone? Howling would ensue. I was really bummed when Fitz didn’t get mentioned in your article. He’s now third all-time in receptions and 10th all-time in receiving yards. What makes this so impressive is that these numbers came while playing in Arizona with some of the, shall we say, less than average QBs that have ever played the position. Also of note is that Carson Palmer passed Dan Fouts for career passing yards, and that David Johnson is quietly putting up huge numbers with, to put it nicely, a not Dallas O-Line. Fitz and Palmer are talking him up as the MVP, but he’s not getting any respect in the national media, which is a shame. File this one under the “I should have written about Fitzgerald this week” error section. He joins a long list of people I’ve ignored when they do great things. David Johnson too. I plan to give them their due before the end of the year.